CONCORD, N.C. — NASCAR officials announced Tuesday two baseline rules packages for the 2019 Monster Energy NASCAR Cup Series season, making a move to bolster competition with enhanced aerodynamic and engine configurations. The different packages will be tailored to the specific tracks on the Monster Energy Series circuit, with a combination of a smaller tapered spacer to reduce engine horsepower to a target goal of 550 (from 750) and aero ducts to foster tighter racing on a majority of speedways measuring longer than 1 mile. 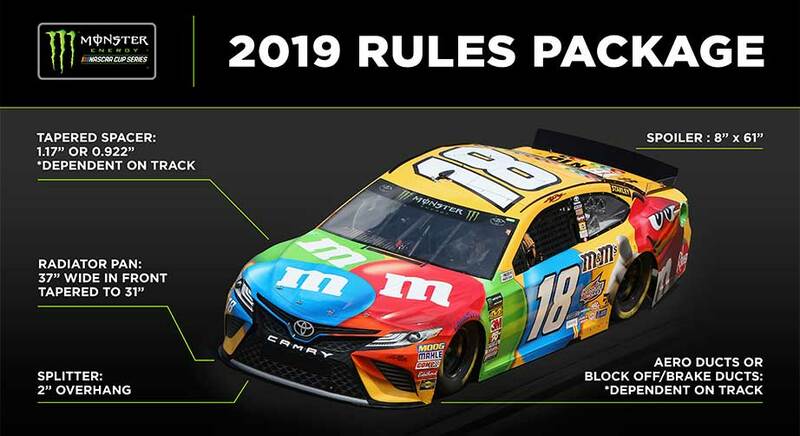 Both features will be in place for 17 of the 36 races next season, excepting the 2019 Daytona 500, which will run with traditional restrictor-plate rules. Five other races will be run with the smaller spacer, but without ducts. The news was officially announced Tuesday at NASCAR’s Research & Development Center. Competition officials delivered the rules guidelines to teams Monday. The baseline aero elements of the 2019 rules package are a taller 8-inch by 61-inch rear spoiler, a larger front splitter with a 2-inch overhang, and a wider radiator pan that measures 37 inches wide in the front tapering to 31 inches at the rear. Those base changes will be in place at every race next season with the intent of adding downforce to stabilize handling, a break from a trend of downforce reduction from 2015-18. Beyond the baseline components are the smaller tapered spacer (.922-inch versus the current 1.17-inch) and aerodynamic ducts to be used at select oval tracks larger than 1 mile. The smaller spacer will further limit airflow through the engine and thereby horsepower to a figure around 550, down from the current 750. Five races at larger ovals are exceptions. Both Pocono events and races at Atlanta, Darlington and Homestead will use the smaller tapered spacer, but will not use the aero ducts that transfer air to the side of the car away from the front tires. Neither the smaller spacer nor ducts will be used at short tracks and road courses. Besides being tested in computer simulations and wind-tunnel time, variations on the new configurations received recent field tests in the 2018 Monster Energy All-Star Race and the NASCAR Xfinity Series on specific speedways. The 2019 package takes cues from those events, which promoted closer competition and increased opportunities for drafting. “From an aero standpoint, I think you’ll see a pretty similar package to what we had in the All-Star Race and what we’ve seen in the Xfinity Series,” O’Donnell said. “Where we looked to make a little bit of a change was around the horsepower and that was, after discussions with the drivers, discussions with the engine builders as well, as what would be something that would produce a little more on-throttle time and have a good relationship with the aero package that we put together. So we made a tweak to that. Events at Daytona International Speedway and Talladega Superspeedway also will be contested without restrictor plates next season for the first time since 1987. The cumulative effect of the base aerodynamic changes, engine restrictions and aero ducts are expected to keep the speeds and competition close to their current style of racing. The exception is the 2019 Daytona 500, which will be held under the current rules with restrictor plates. O’Donnell said his department’s arrival at two primary rules packages was the result of collaboration within the industry. It was also an effort to avoid a cost-prohibitive rules adjustment at each of the 24 circuits (counting the new Charlotte combination oval and road course) where the Monster Energy Series competes. “It became evident as we ran through a lot of our data and talked through the possibilities with the owners, with the OEMs (original equipment manufacturers), with the engine builders that if we could stick to as close as one package as possible, it would not only be more efficient but we thought it would really produce the best racing in terms of putting this package together from an aero and engine standpoint,” O’Donnell said. O’Donnell admits that he has heard preliminary critiques of the 2019 rules configuration from some drivers and fans, but that he’s also received reassurance from others that the direction for the new rules package is the right one. “I think it’s important for a fan to let it play out, right?” O’Donnell said. “I’ve heard it from some of the drivers, but I’ve also heard the opposite from some of the drivers, and I think what’s important to focus on for next year is we want the focus to be on the drivers. They’re our stars and the athletes as well as our teams. If you look at where the sport is today, I think the balance might be a little out of whack in terms of the importance of aerodynamics versus the driver and the car, and so the purpose of this is really to put it back in the drivers’ hands. Three confirmation tire tests are scheduled for the 2019 NASCAR rules package before the end of the year — one-day tests at Charlotte and Atlanta, and a two-day test at Las Vegas. Teams will also get a taste of next year’s package at a test at ISM Raceway on Wednesday, using the baseline rules changes (no smaller spacer, no aero ducts). • The previously announced enhanced vehicle chassis (EVC) will be mandatory at all races. • NASCAR has reduced the amount of organizational tests for the calendar year from four to three. Additionally, Goodyear tire tests in 2019 will be conducted by three teams, down from the current four. • NASCAR will expand the use of sealed engines next season, increasing to three long block seals in addition to keeping the current 13-race short block seal requirement.